Application Note IGF0018: IGFBP Proteolysis: Comparison of methods. There are numerous reports on IGFBP proteolysis. IGFBP-3 proteolytic activities have initially been found in pregnancy serum. Later fragments have been detected in other body fluids (1). IGFBP-3 protease activity has been measured by different techniques as immunoblot and ligand blot (2, 3, 4, 5, 6, 7, 9), substrate zymography (7), FPLC (8) or in assays using 125I-IGFBP-3. ibt has developed reagents and assay kits for non-radioactive detection of IGFBP protease actvities, starting with human IGFBP-3. We therefore have compared the different methods we offer using plasmin as one of the known proteases for IGFBP-3. Biotinylated and non-biotinylated glycosylated recombinant IGFBP-3 have been proteolysed by plasmin under identical conditions. For proteolysis, we incubated 0.5 µg of IGFBP-3 with 10 µg, 5 µg, 1.25 µg, 0.25 mg and 0 mg (as control) in a total volume of 40 µl Tris-HCl pH 7.5 for 30 min at 37 °C. The reaction was stopped adding 10 µl of a stock solution of a protease inhibitor cocktail (1 Complete Mini tablet, Roche Applied Science, in 1.5 ml water). The measurement was done with 100 µl aliquots diluted to a concentration of 10 ng/ml with the Direct IGFBP-3 Proteolysis Kit (see Application Note IGF016) and 50 ng/ml with the IGFBP-3 PROLICIA (see Application Note IGF017). 40 ng samples of the Plasmin digested biotinylated and non-biotinylated IGFBP-3 were separated by SDS-PAGE and blotted to a nitrocelluse mebrane and detected according to Application Note IGF007. The primary antibody (M02-IGFBP3) was used at a dilution of 1:500 with an incubation time of 2 hours and the conjugate was used at a dilution of 1:1000 with an incubation time of 1 hour. 1.3. Measurement of IGFBP-3 Proteolysis by Immunoblot and Western-ligand Blot. In a second experiment we digested non-biotinylated 0.5 µg IGFBP-3 with 10 µg Plasmin for up to 30 minutes. 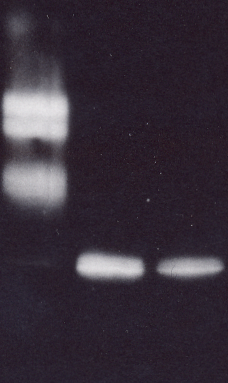 Samples were diluted to a concentration and 10 ng IGFBP-3 were seperated by SDS-PAGE. Immunoblot was performed according to Application Note IGF007 and Western-ligand blot was performed according to Application Note IGF005. The exposition time was five seconds for the immunoblot and 30 seconds for the ligand blot. The measurement of IGFBP-3 protease activities by the Direct IGFBP-3 Proteolysis Kit and the IGFBP-3 PROLICIA showed some differences in the amount of proteolysed IGFBP-3. This may be due to the differences in the methods or due to a slower degradation of the biotinylated IGFBP-3 compared to the non-biotinylated IGFBP-3. 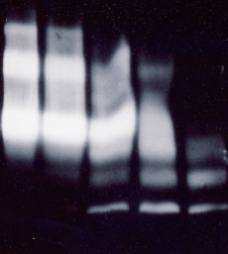 The results of the western immuno blot with biotinylated (Fig. 1) and non-biotinylated IGFBP-3 (Fig.2) were in agreement with the results of the ELISA format assays. The biotinylated IGFBP-3 was more resistant to proteolysis by Plasmin and degradation was slower. The fragment pattern was equivalent for biotinylated and non-biotinylated IGFBP-3. Both samples show dimeric and multimeric forms in the control and fragments of ca. 30 and around 20 kDa in the proteolysed samples. Fig. 1; Immunoblot with proteolysed Biotin-IGFBP-3. From the left to the right: samples digested with 0 to 10 ng Plasmin at 37 ° C for 30 minutes. Fig. 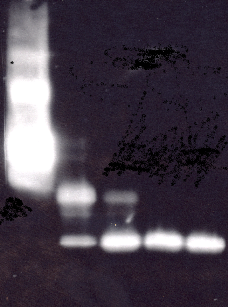 2 Immunoblot with proteolysed non-biotinylated recombinant IGFBP-3. 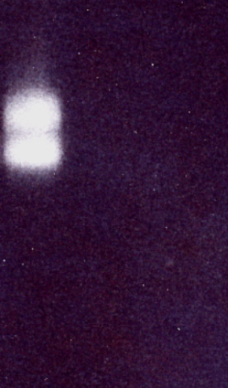 From the left to the right: samples digested with 0 to 10 ng Plasmin at 37 ° C for 30 minutes. The comparison of western immunoblot and western-ligand blot showed, that only the intact IGFBP-3 was detected under this conditions in Western-ligand Blot. Fig.3: Western Immuno Blot of Plasmin digested recombinant glycosylated IGFBP-3. Fig.4: Western Ligand Blot of Plasmin digested recombinant glycosylated IGFBP-3. The results show, that the described methods are helpful tools to detect and measure IGFBP-3 protease activties. The comparison of biotinylated and non-biotinylated IGFBP-3 as a substrate in the IGFBP-3 PROLICIA showed, that the non-biotinylated IGFBP-3 is digested more rapidly by Plasmin, than the biotinylated IGFBP-3. It is concluded that use of the non-biotinylated IGFBP-3 as a substrate may be closer to the conditions in the human body. However, in complex samples of human origin, non-proteolysed intrinsic IGFBP-3 may be present even in samples containing IGFBP-3 proteases and could affect the results. Also, at least theoretically, free IGF´s may be present in a very high concentration and also could compete with the binding of IGFBP-3 to the biotinylated ligands. Therefore, it is necessary to perform appropriate controls in complex samples. On the other hand, the use of the biotinylated IGFBP-3 in the IGFBP-3 Direct Proteolysis Assay Kit is not affected by intrinsic IGFBP-3 or free IGF´s. Therefore, though the protease reaction is slower, the test may be a helpful tool in screening for protease activties or in comparison of protease activities in different samples. For quantitaive measurements of IGFBP-3 protease activities samples containing no intrinsic IGFPBP-3 we recommend the IGFBP-3 PROLICIA. The results of the immun blots and the western-ligand blot show that they may be used either to detect or measure IGFBP protease activities directly or for control experiments after ELISA measurements. The ligand-blot method was less sensitive, but may be easier to quantitate by densitometric scanning. The western immuno blot showed a higher sensitivity and information is obtained on the size of fragments. 2.) In vivo proteolysis of serum insulin-like growth factor (IGF) binding protein-3 results in increased availability of IGF to target cells. Blat, et al. J. Clin. Invest. Volume 93, May 1994, 2286-2290. 3.) Plasma insulin-like growth factor binding protein-3 proteolysis is increased in primary breast cancer. Helle1 et al. British Journal of Cancer (2001) 85(1), 74–77. 4.) IGF-I, IGF-I-binding proteins and GH-binding protein in malnourished elderly patients with inflammation receiving refeeding therapy. Raynaud-Simon et al. European Journal of Endocrinology (2002) 146 657–665. 6.) Effect of Intense Exercise on Inflammatory Cytokines and Growth Mediators in Adolescent Boys. Nemetet al. Pediatrics 2002;110;681-689. 7) Insulin-like Growth Factor II Signaling in Neoplastic Proliferation Is Blocked by Transgenic Expression of the Metalloproteinase Inhibitor TIMP-1. Martin et al. The Journal of Cell Biology, Volume 146, Number 4, August 23, 1999 881–892. 8) Insulin-like Growth Factor Binding Protein (IGFBP)-3 Protease Activity Secreted by MCF-7 Breast Cancer Cells: Inhibition by IGFs Does Not Require IGF-IGFBP Interaction. Salahifar et al. Endocrinology Vol. 138, No. 4 1683-1690. VOLUME 64, NUMBER 5, 865-872.